KaimukiHawaii.com is a FREE Web site for all. It is Ernest Abrams/MacBusiness Consulting (MBC) and this Web Site's mission to get the word out about Kaimuki and bring the community together. Thanks for posting the Movie Museum schedule. I get all sorts of positive comments about your website. Isn't it amazing how much our little neighborhood of Kaimuki has become such a destination? You have something to do with it, no doubt. Learn more. Thank you for thinking of us. You amaze me with your successful marketing concepts and support for your own community. Your online newsletter is fantastic. People enjoy, benefit from and respect what you do. www.KaimukiHawaii.com is the best Kaimuki has to offer and a great resource to for all things KAIMUKI! I am a fan. 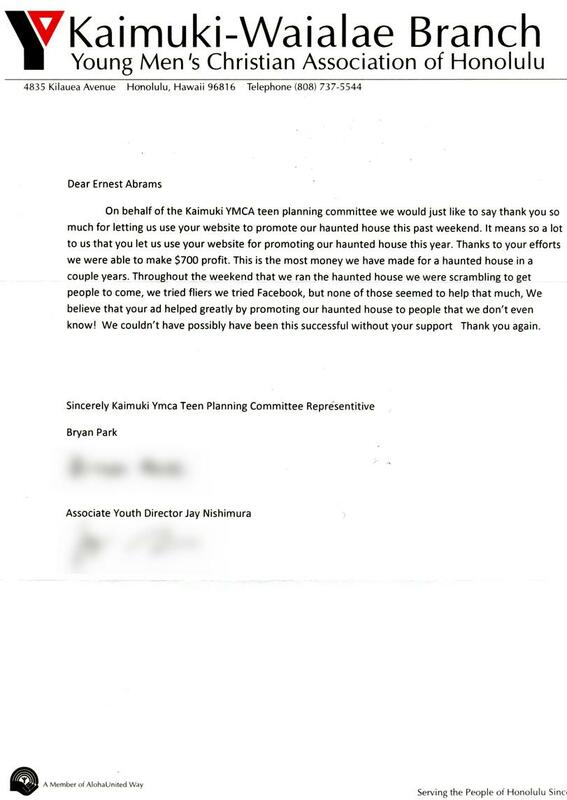 On behalf of the Kaimuki YMCA team planning committee we would just like to say thank you so much for letting us use your website to promote our haunted house this past weekend. It means a lot to us that you let us use your website for promote our haunted house this year. Thanks to your efforts, were able to make $700 profit. This is the most money we have made for a haunted house in a couple of years. Throughout the weekend that we ran the haunted house we were scrambling to get people to come, we tried fliers we tried Facebook, but none of those seemed to help that much, We believe your ad helped greatly by promoting our haunted house to people that we don't even know! We couldn't have possibly have been this successful without your support. Thank you again. Ernest Abrams has been a staunch supporter and resident of our Kaimuki community for several years. He recognizes the aloha and sense of community that this small historic town has. I have known Ernest virtually from the beginning when he went door to door in town introducing himself and his www.KaimukiHawaii.com website. I immediately picked up on his honesty and sincerity and signed up Queen Lili`uokalani School (QLS) as a participating business in Kaimuki. Since that time he has gladly posted school events and kept our informational brochure online. When Queen Lili`uokalani School was in jeopardy of closure Ernest, using his initiative and expertise, created an online petition over one weekend to get as many signatures as possible (we received over 350 online signatures!) to support QLS. (I only asked him to post a scanned image of a petition to download!) You can't ask for a better friend than Ernest!! Thank you very much!!! Really glad to have our agency listed on this site. Ernest has been great to work with, and I love the work he did on our profile! Thanks Ernest!! Ernest has helped the Kaimuki community be more in-tune with our own Kaimuki neighbors. Kaimuki Business & Professional Association (KBPA) used to send out a monthly calendar of Kaimuki events by email to Kaimuki businesses. Ernest became aware of this and suggested putting up a website and automating the monthly emails. He helped KBPA send out an "eblast", which is an email that was personalized with the recipient's name and a link to the community calendar. Ernest, on his own initiative, designed the KaimukiHawaii.com website where Kaimuki connects with it's neighbors and others can find out what's happening in Kaimuki. Ernest built an extensive list of businesses in Kaimuki, has a calendar of events, offers free webpages for Kaimuki businesses to feature themselves and highlights companies each month. He is always looking for ways to help the businesses generate more foot traffic and for our events to have more in attendance. Ernest has spent countless hours to promote Kaimuki through the website and has helped to bring the community together. He definitely has a good heart and he is an asset to Kaimuki. For the past 5 years Ernest Abrams has been a catalyst and organizer in bringing the Kaimuki community together and giving it a stronger identity within its sense of place. Mahalo Ernest for establishing KaimukiHawaii.com as "THE place to go" to find out what's happening in our neighborhood, who's doing it, where and when. "Thank you for the great presentation at our Lions Club meeting last night.... It's exciting to see a bit of your talent and your community service, and look forward to the possibility of having you join us in future events, and perhaps even become a Kaimuki Lion! I'll continue to let my friends know of your Web site. Keep up your good work." Ernest and his wonderful website have been an immense help to Kaimuki Public Library by publicizing our free community events. Ernest is always extremely prompt and accurate. He goes to great lengths to make sure that our write-up is precise in every respect. And, after all, it doesn't really matter how great a free program is if no one knows about it! A sense of community is so essential, and Kaimuki Town has so very much to offer. Ernest deserves much praise and appreciation for his exemplary efforts on behalf of our neighborhood. On behalf of Kaimuki Christian Church, thank you so much for all your support! Kaimuki is a vibrant community that is a unique blend of business, culture and community with a small town sensibility and camaraderie. Storto's Deli Honolulu has had a blessed first year in the South Shore (35-years on the North Shore) and we are grateful to the people of Kaimuki, for its friendship and generosity. Storto's Deli is unlike your typical sandwich shop, everything that goes into our products is unique and specially provided for our customers. Our goal is to provide the very best to everyone who visits, a philosophy that also applies to the community of Kaimuki. KaimukiHawaii.com has been such a strong advocate for us, Mahalo, Ernest. Ernest has spent countless hours to promote Kaimuki, and we are fortunate to have a web master like Ernest. The community of Kaimuki is like family and we look forward to many years with the ohana! It is always a pleasure working with Ernest Abrams/MBC. His dedication to the Kaimuki Community is in the spirit of Aloha. KaimukiHawaii keeps the community connected and is a wonderful resource to find local talent, local services, and local products. Thanks, Ernest! Love the site, visit it often. Ernest has been so helpful and informative about the benefits of eMarketing and maintaining an effective PR campaign on-line. He proven his ability to deliver paying customers to our door during our introductory $3 pizza offer, which seemed to 'go viral' when Ernest stepped in on behalf of Kaimukihawaii.com. This website is a real service to our community. Thanks Ernest!